The league needed a bounce. Meyer was there for it. Meyer immediately provided one, especially when it came to recruiting young high school athletes. As Meyer retires from Ohio State, his impact on a league he dominated in. He led the Ohio State Buckeyes to three conference championships, division titles in all seven seasons, and a 54-4 record in conference games. Urban Meyer would bring in top-10 classes every year, including ESPN’s No. 2 class in both 2017 and 2018. “When I was in the SEC, they said certain things about the Big Ten,” said Indiana coach Tom Allen, a Ole Miss assistant from 2012 to 2014. “There were several years in a row where the Big Ten would get to the BCS [bowls] and then got a little exposed in some ways. Even when Alabama played Notre Dame, they got exposed a little bit and they kind of got labeled, ‘They’re just a Big Ten-type team.’ I think that label’s gone away. NFL scouts have told Allen that they’ve seen a difference in Big Ten players during the time period that goes with Meyer’s Ohio State era. More Big Ten players are on the NFL radar now, which Allen links directly to the recruiting approach Meyer brought. 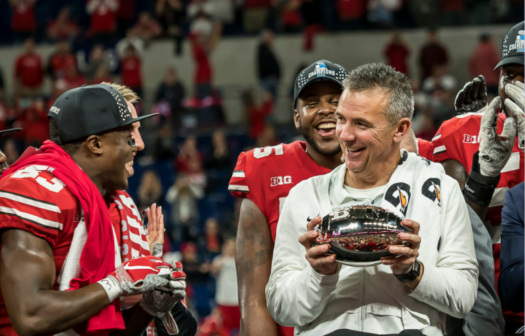 Although Meyer is responsible for the Big Ten’s only national championship during his era (2014), the Big Ten has eight New Year’s Six bowl wins since 2013. It had just three wins in the big bowls between the 2006 and 2012 seasons. The Big Ten’s 7-1 bowl record after the 2017 season including the wins in the Goodyear Cotton Bowl, PlayStation Fiesta Bowl and Capital One Orange Bowl. Urban has made his statement.